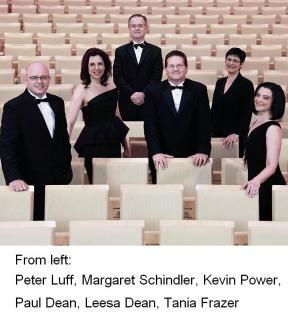 Southern Cross Soloists was established in 1995 and has built a reputation as one of Australia’s leading chamber music ensembles. The ensemble maintains an extensive schedule of performing and teaching in Australia and includes visits to the United States, New Zealand, Canada, South Korea and China. It presents an annual subscription series in Brisbane, tours nationally with guest artists, appears at numerous festivals around Australia and presents the Bangalow Music Festival. The ensemble has a strong commitment to furthering music education, and presents an annual music camp in Rockhampton as well as visiting regional centres to inspire music students over in masterclasses and performances. Southern Cross Soloists, currently Ensemble in Residence at the Queensland Performing Arts Centre, is dedicated to supporting Australian composers commissioning more than 45 new works. Clarinetist Paul Dean is the Artistic Director of the Australian National Academy of Music and is in much demand internationally as a soloist, chamber musician and orchestral player. He regularly appears at both Australian and International Music Festivals and has appeared as a soloist with most of the major orchestras and chamber ensembles in Australia. Creative Director Tania Frazer, formerly Principal Oboe with the Israel Symphony Orchestra and the Australian Chamber Orchestra, enjoys a busy career as a soloist and teacher. A recipient of numerous prizes and awards, Tania won first prize at the Coleman International Competition in L.A., the Queen Elizabeth Silver Jubilee Award in London and has appeared in orchestras all over the world under concuctors such as Zubin Mehta, Valery Gergiev, Lorin Maazel, Rostropovich, Christoph Eschenbach, Neemi Jarvi and Sir Neville Marriner. Lyric soprano Margaret Schindler, a Senior Lecturer at Queensland Conservatorium Griffith University, is an internationally recognised teacher, in great demand as a recitalist, particularly for her performances of baroque and contemporary repertoire. Margaret has appeared as a soloist with orchestras in Australia and Europe. Horn player Peter Luff is a Senior Lecturer at the Queensland Conservatorium and Associate Principal Horn with The Queensland Symphony Orchestra. He is highly regarded as a player and teacher throughout Australia while also developing a successful career as a conductor. Kevin Power pursues a busy freelance career as a pianist, performing regularly as a soloist, accompanist and chamber musician. He was formerly on the staff of the Queensland Conservatorium and is the Chorus Master and Musical Director of The Queensland Choir.